Capacity Range: 3000 - 23,000 lbs. 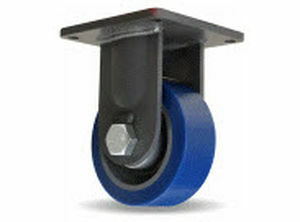 Swivel Construction 5/8" thick drop forged steel mounting plate (rigid plate 1/2" thick); 3/8" x 5" plate steel contoured legs are welded inside and outside to forged steel horn base. Kingpin 1 1/4" diameter integrally forged with mounting plate guaranteed for life, prevents bending or breaking; threaded for 1 1/4" slotted nut secured by roll pin for positive locking. Main Load Bearing HPI™ thrust bearing with outside diameter of 7 1/2"; raceways hardened to 58-62HRC and ground to surface finish 16 micro inches. Secondary Load Bearing 1 1/4" precision tapered thrust bearing counteracts radial thrust. Axle1 1/4" diameter grade 5 hex head with slotted nut and cotter pin. 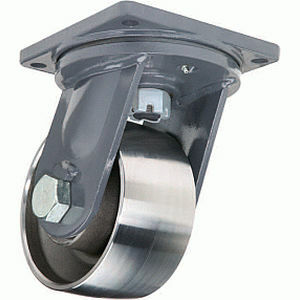 Lubrication FittingsBall-check type in swivel assembly and in wheel hubs with tapered or straight roller bearings. The new technology is a significant upgrade from conventional ball raceways or unit load bearings and provides an even stronger platform to support Hamilton’s three year product warranty.